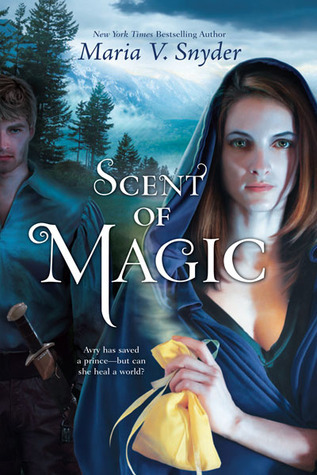 A quick and enjoyable fantasy story, Scent of Magic is the sequel to Touch of Power. I enjoyed Touch of Power, but found some faults with it that I couldn’t entirely forget. Scent of Magic has a whole bunch of faults of its own. Every one except Kerrick thinks Avry is dead. This puts her in a very convenient position to spy on Estrid’s army without anyone suspecting a thing – but Kerrick must go to his realm to head his own army. Separated they both face betrayals, dead soldiers and other enemies. Let’s start off with the good. Maria V. Snyder has an incredibly readable writing style. This book has over four-hundred pages, but I just flew through it as if it was half its length. I think part of this is because she uses very modern dialogue and doesn’t shy away from fashionable words and expressions, where as other fantasy writers tend to have a more archaic style (I’m looking at you, G.R.R.). Overall it makes reading her story a breeze. It’s mainly the content that I’m having troubles with. The whole reason why Touch of Power worked was the chemistry between the characters – with most of the characters split up or absent in Scent of Magic that chemistry is gone. For the most part there isn’t that much plot to keep the pace going. Snyder tried a trick to disguise that, which I very much despised while reading this book. Every. Single. Chapter. Ends. With. A. Cliffhanger. This annoyed me so much while reading. Seriously. Sometimes you just want to finish a chapter and have it being FINISHED. I don’t want the chapter to stop the SECOND something interesting happens or something is revealed. Whether you dislike cliffhangers or not, the truth of it is is that it takes away the speed of the story. When Kerrick is in life danger, you don’t want to read about Avry washing her hair (making this up, but that’s how it feels). Once Avry is finally done with her boring stuff and we’re back at Kerrick, the whole excitement has just been completely deflated. And don’t get me started on all the chapters that end with a clever (read: overly dramatic, you can hear the DUH DUH DUUUUMMMMM in the background) remark *shudders*. The story was okay. It wasn’t overly exciting, but there were some nice plot twists that I didn’t see coming. It reads a bit like fantasy-light. It has fantasy and realms without the commitment. You really don’t need to bother with remembering them all because most of them don’t play a role anyway, and if they do, it will be spelled out for you. Scent of Magic isn’t that bad, but I’m not so excited about it as other readers either. I will pick up the next book because I’d like to know how the story continues (the story ends with a cliffhanger as well – no surprises there), even though I don’t really care about the characters. Especially Avry has become very dull for me, as she barely missed Kerrick who she is supposed to be so in love with. I’m more interested what happens with Danny and Zila and Belen. Figures that the secondary characters are more interesting than the main ones. War is coming and Avry is alone. Unless she figures out how to do the impossible … again.